A big thankyou to Graham and Kaye at BladeRubber Stamps, who arranged for me to be at the Ranger On The Road tutorial at the NEC last Saturday. I got to take a class with Tim Holtz and Dyan Reaveley again (remember I was there last year). The canvases were already covered with his new Tissue Paper (like tissue tape, only bigger) and we used the new Dabber in Picket Fence - adds an opaque white and shabby chic finish. I used mine liberally on my metal bits and pieces. Work in progress, the little canvases covered and the embellishments ready to add on. 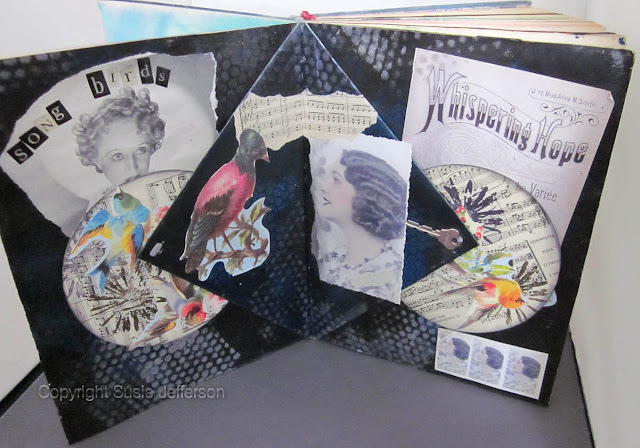 Dyan had us doing an altered book pocket page spread. Tim was rather taken with the 2 pockets - and personally fetched me two extra brads! So I got to finish the page off properly. Much appreciated. Dyan also as a brand new range of stamps (above) which were excellent for journalling. BELOW: And here's one I made earlier (about 8 years earlier in fact - I was one of the first in the UK to teach altered books). This one has decorated CDs fastend behind the points of the triangle pages, to make spinners.